The lead singer of Grammy-nominated heavy metal band As I Lay Dying has been arrested in Southern California as authorities said he tried to hire an undercover detective to kill his estranged wife. 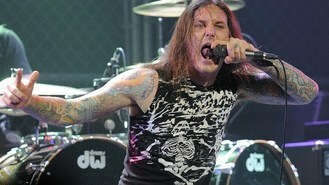 Tim Lambesis, 32, was arrested at a retail business in Oceanside, the San Diego County Sheriff's Department said. The statement said detectives received information on Thursday that Lambesis had solicited someone to kill his wife, who lives in nearby Encinitas. A task force from several law enforcement agencies quickly launched an investigation that led to the arrest. The department would give no further details on the investigation. As I Lay Dying formed in San Diego in 2000 and has released six albums including 2007's An Ocean Between Us, which reached No 8 on Billboard's charts. A track from the album was nominated for a Grammy for top metal performance. According to their website, the band is scheduled to tour the country with several other metal acts starting later this month.